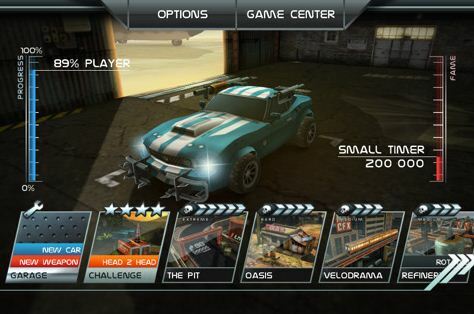 Reckless Getaway by Polarbit sets a new bar for excellence in 2D/3D driving on the App Store. The game revolves around you dodging cops and obstacles yet the real fun comes by destroying your surroundings. As the getaway car for a bank robbery (shown in an opening cut scene), the game puts you in several different vehicles in a quest to get away. All the while a great soundtrack puts you in the mood to drive. The controls are very well done and you will be able to pick them up quickly. Weaving in and out of traffic earns you points (as does hitting cars and knocking them off the road). Throughout the levels you will have several different vehicles at your disposal and each handles based on the size of the car. The controls are incredibly responsive which allows you to make last second decisions like whether to jump a pit using the ramp or bypass it using the nearby dirt road. The graphics are great and look very smooth on my iPhone 4. Despite the utter destruction of the environments as you drive past at maniacal speed, you won’t notice any slowdown and the details all look fantastic. The sound is also well done. The music in the background gives you a fantastic back beat to the getaway and the crashes and explosions throughout are all well done as well. The production value on this game is incredibly high and a pat on the back should be given to the sound and graphic guys at Polarbit. The real meat of the game is making a getaway and earning points. You start with the possibility of earning 4 coins. Each time you wreck you lose a coin with no way of gaining it back during that level. These coins are important because getting enough allows you to unlock the next 4 levels of the game. This is worth noting because as the game becomes more difficult in later levels, these coins are increasingly hard to get. You’ll find yourself going back to an old level and replaying it a ton of times just to gain the 4th coin you missed the first time around. That being said, it does provide a fun system of unlocking and rewards a player fairly consistently with new levels. You’ll also find powerups as you’re driving through each level, each one providing some additional benefit to your car. These help you rack up the points quickly which in turn help you earn towards those four coins mentioned above. In all, the game is a blast to play yet won’t take much more than a few hours to finish. Regardless, for just 3 bucks Reckless Getaway it is well worth it and I highly recommend buying it.